Never underestimate the strength, abundance and depth of your Being. You are each an aspect of Creator God--- and it is in your forgetting of this that you experience fear, pain, loss and separation from each other, yourself and most of life. In your quiet times, which one needs to create for her/himself, intend to connect to creator and your Soul. It is in this conscious connection/unity that you will find peace of heart and mind. Calm, clarity and greater vision/understanding of your life and situations and relationships in your life become clearer. Wisdom comes in how to handle experiences and forward movement and personal growth. Stop. Become grounded. Breathe. Connect to your soul. Connect to Creator God. Stay in this space as long as you are able to. Be still. Be at peace with yourself. You are loved and appreciated more than you know. Call for angelic support as needed; we are here always for you. We are with you always. Always here, ready for your call, thought, intention that you have in seeking support, understanding, strength emotionally, physically, or spiritually. It is the Angelic Realms purpose for being here on earth with you--- to be here at all times for YOUR support. Always. Never doubt this. If you have a heavy heart, or your mind is running crazily with fear and or doubt about your own success and survival; stop and call my name aloud, ( or in your mind). I will be next to you instantaneously. Stand still and allow yourself to feel my presence. Have faith in this promise. I will support you in calming, centering and protecting you. The Angelic Realm and I are here for you. With love and respect for you. Peace, unity and unconditional love are the intentions and energy that is needed now as our Presidential election is just days away. We each are needed to share and send our integrity and compassion out to not only our fellow Americans, but to all of humanity. Several years ago Spirit gifted me the concept of a Global Healing meditation. A channeled meditation where you receive personal healings and one may choose to send love and blessings to all forms of life on earth. Sending peace, love, healing to all areas of the globe, and peoples of the world, in support of them. I remember when I first began this, the meditations were focused on different geographic locations in the world affected by earthquakes, tsunamis and war. Fairness, honesty and forgiveness are required now, and moving forward. Please take the time to send unconditional love to everyone affected by the election; envisioning a peaceful election and a unified country. Sending you peace, love and blessings in support of your Divine Being. Archangel Metatron, as protector of earth and humanity, I ask you now to be always present here with us, and shower earth and all peoples with unlimited love, compassion, understanding and forgiveness for one another. Bless our hearts and minds with forgiveness so that we each may be the greater soul that we truly are. Bless earth and all forms of life here on earth. Thank you for calming our minds and holding our tongues, so that we speak only truth and blessings for ourselves and one another. Guide as all so that we are responsible for all that we do and say. Bless our coming Presidential elections, so that the best and most qualified and ethical candidates are chosen. Blessings to the United States of America, and all nations and peoples of the world. God Divine knows and understands all. The world of humanity is in it's lowest depths; spiritual divinity and grace are needed by each of us now. Are you able to feel and know the love that is in your heart? If you have love and compassion for yourself and your fellow humans, please send some blessings and intentions of love and peace to all others. Send out as prayers or blessings. If you are in sadness, despair or loneliness, ask God and the Angelic realm for love and healing support of you. You will receive it. You are always connected to The Divine. Ask for assistance and be open to receive it. Remember to give thanks for all that you do have. The angel messages that I have been relaying to you since October of 2009 have now been changed to inspirational prayers. I believe prayers to be our conversation with God Creator. Some formal/traditional prayers are well known to many; bringing comfort with these prayers. Your conversations with God may be considered prayers, as they are from the heart and meaningful. All prayers are meant to aid you in living and feeling your oneness with God Creator. I know that you see and understand all the pain and sadness that I am experiencing now from the meaningful relationship, (or situation) that has fallen apart. I ask and trust you to bless me with additional emotional support and clarity, so that I may see things as they are, and inspire me as to how to improve them. Help me to open to forgiveness of myself and the other(s) involved in this relationship, ( situation.) I accept more love and patience for myself--so that I may do my best to allow love to flow in me and to those whom I find challenging. May this prayer inspire and support you. The Angels of Patience are here to assist you in becoming calm, peaceful and accepting of yourself as you are. These angels are here to aid you in accepting healing energies of patience for yourself, so that you may know yourself as a divine aspect of Creator. As you understand yourself and take responsibility of yourself as a spiritual being, you open to accepting and feeling divine love and guidance which is always available to you. This greater view and understanding of yourself assists you in creating better solutions to the challenges in your life. Feeling a closer connection to The Divine will also help you to have a more balanced and optimistic view of yourself, (more happiness,) your life and your goals. Continue to ask for support and be open to “hear and feel” it coming to you. Every soul here is unique and has its own blueprint for this lifetime. A great part of patience means surrendering to Divine Will. From a larger perspective, what is in your highest and best good? Sometimes you are so close to the situation that the answer is challenging to discern. This is where patience with yourself comes in. The Angels of Patience assist you in having faith in yourself to get through life lessons that are disguised as challenging situations or people in your life. The Angels help you to be brave, to feel, discern and become more flexible in your creative solutions. On your spiritual path, patience and perseverance are needed for your personal transformation. Call upon the Angels of Patience anytime. These angels may be called upon so often that you may choose to give them a nickname; please do! Your confidence and partnership with all angels is important. Do what feels right for you. As always, we thank you for this time together and we send you love and blessings. We hope that more and more you know yourself to be part of all of creation; that you are needed, appreciated as a unique and blessed soul, vital to the well-being and further development of humanity. The Archangel Sandalphon is the angel of guidance and assists you by carrying prayers to God. Sandalphon also assists in bringing joy, beauty and strength to you. Archangel Sandalphon works with the choir of angels known as the Seraphim; they are the highest order of angels which surround the throne of God. Supporting you in self-forgiveness, Sandalphon is available to assist you at times in your life when you have doubts and fears about your talents and abilities to produce the very best results from your work and efforts. Archangel Sandalphon assists to strengthen your ability to trust yourself and claim your personal power in overcoming challenges in your life. Prayer is one of the strongest tools you have in connecting with the Divine and Sandalphon assists you with them. The color turquoise and music also resonate with Archangel Sandalphon. You may choose to use these items as you meditate upon this Archangel. We are here to support you in creating a closer and clearer union with The Divine. Archangel Metatron is the only angel to once be human; he was known as Enoch, a scribe and a pious man, taken to heaven by God. Metatron is the recorder of all of mankind’s deeds and as a scribe journals those in your Book of Life. Metatron helps you realize your potential for love and compassion for yourself and others. Metatron has been called The Price of the Divine Face and the bridge between The Divine and mankind. He is charged with the sustenance of the world. You may call upon Metatron to help you find perspective in your relationships and situations in your daily lives. Archangel Metatron may help you find balance and create boundaries between what you give to others and what you do for yourself. Knowing the best of you, Metatron may assist you in releasing addictive habits. Always ready to assist you in your times of challenge or in your personal growth, Metatron is a powerful Archangel here for you. We bring you inspiration and comfort. With thanks for you and all that you are. What is in your heart? What is it that you dearly wish to create for yourself, and from yourself, to share with the world? How do you want to be feeling, living within the next few days, weeks, months? Are you seeking to stay balanced, peaceful, or create new or better relationships? Are you working on releasing old illusions and patterns of behavior that have left you feeling less than your true, confident and compassionate self? Or are you ready to develop a new career from the experiences and wisdom that you have gathered this lifetime? Whatever needs that you have in your self-development, the Angel of Vision, Paschar is always available to support and assist you in your process. Paschar aides you in working with your conscious and subconscious ideas and beliefs; helping you to actualize your best self now. Your journey begins right at this moment, and we angels are always here to assist you with every step you take. It is by your invitation, your request that we work with you. May you be open to knowing and feeling our support for you. We thank you for this time together and see the love and potential that you have within yourselves. We are pleased to be with you again and thank you for your consideration and time with us. This is your time of new beginnings. Archangel Michael is here and ready to work with you and your aspirations, goals and plans in creating a healthier, more balanced and profound you. Whether you are working on your personal beliefs, mindset, habits or lifestyle, Michael is here to support you with personal strength, physical strength, and strength of spirit (will power). Nothing is impossible. You are not alone in your work. Your personal transformation/growth is your life’s work. Assisting you in this endeavor is one of the reason angels are here. Archangel Michael is the angel of strength, mercy, right actions/ justice, protector, careers, and aides in uplifting one’s spirit. Take time to clearly set your personal goals;( write them down if you feel this will help you focus on them daily;) call upon your faith and will power to create these changes in yourself and your life. See yourself accomplishing your goals. Ask Archangel Michael to assist you in all phases of your work---he will. With respect and admiration of you. 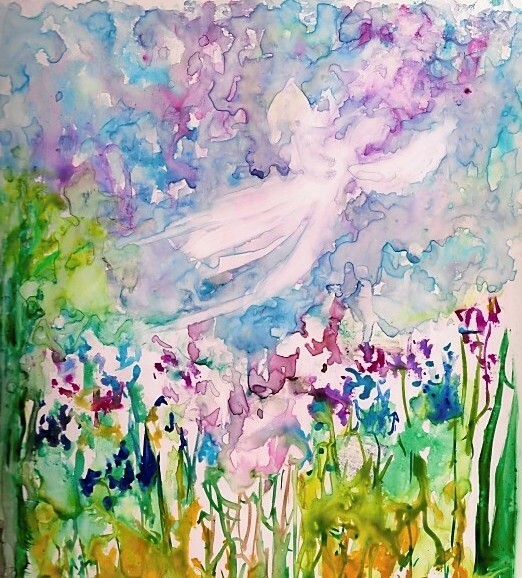 The Angel of Glory is here to help you celebrate and be in gratitude for the simple things in life; the sky, sunlight, air, rain, flowers, animals, evening, food, each other. The Angel of Glory reminds you that God/The Divine, is in e v e r y t h i n g. This angel reminds one to give thanks for all that you have, use, give and receive. The Angel of Glory asks that you open your hearts and understand just how much you truly do have to be thankful for. Air, oxygen, water, warmth, shelter, family and friends to list just a few. During this time of year, you may be more focused on material goods, party plans and schedules. The reason for this holy season is to remind you of your oneness with Divinity. The Angel of Glory is here for you always. When you honor and respect God, you are honoring all of life. Doing this opens your heart, mind and soul; growing your spiritual aspect of yourself to higher levels and achieving greater insights/wisdom for you to live by. Angels are available to you for any matter in which you seek support and or to share your gratitude. Wishing you a very blessed and peace filled holidays. We speak to you today about the Angel Rhamiel who is here to assist you in your ability to care, empathize, and protect yourselves and others and the world as a whole. As part of creation, you are part of Creator God. As such, happiness, love and good health are always available to you. It is your choice in choosing your thoughts, words and deeds to draw to you experiences of joy, peace and prosperity. Angel Rhamiel works with you and your thoughts; working on your conscious and subconscious thoughts of self-acceptance and self-love. As you allow yourself to understand your own goodness, you accept yourself as you are; flaws and all. Being truthful with yourself you understand that you have the ability and the power to change your self-image of yourself and your self-worth. Change of heart and mind takes time and dedication. As you become less critical of self, you will become less critical of others; understanding that we each have challenges and that it is dealing with one’s challenges that you make choices. Challenges are your greatest opportunities to learn more about yourself, and to see where your old beliefs and habits may be limiting your higher ideal of your better, more understanding and loving self. Angel Rhamiel will aid in giving you courage and loving support to do this. With humility and inner peace you may open to thinking, feeling and being more loving, compassionate and forgiving of self and others. Angel Rhamiel is dedicated to supporting your efforts in you becoming your highest and best self. With thanks for you and our time together. It takes great energy, clarity, love, conviction and empathy to handle some of the many situations and life challenges that you deal with each day. We applaud you for your daily commitment to life. We understand that there are times when you doubt yourself because of difficulties in your life. Situations and or relationships that are pushing you beyond your comfort levels. Are you choosing to live with bad relationships or situations because they are major aspects of your life right now, and it would be uncomfortable to end it? Angel Yahoel, (Jehoel) is the Angel of Presence. This angel is known to be a mediator and helps to bring order out of chaos. We invite you to call upon Yahoel when you need personal and spiritual strength to either let go of, or gain greater clarity in understanding personal relationships and situations that are limiting your personal sense of self-worth. In response Angel Yahoel will bring you truth, strength, and clear thinking, to take the steps necessary to understand, release or change the situation, and receive healing energies for your support and spiritual growth in this process. We thank you for this time together and are always available to you. Throughout your day, you make innumerable decisions; some decisions more important than others. Do you complete your tasks at home, at work; help a co-worker, help your child? Lend a hand to your friend? Do you understand that your significant other needs you to be a better listener, and needs more compassion from you? Do you decide to donate to charity, or save for that vacation that you have dreamt of? How do you handle the tensions that family differences have created at home? How do you handle an aging family member? With each decision that you make, it is your integrity that is called upon. Angel Haamiah is the Angel of Integrity and is always available to help you make honorable and ethical decisions that are a reflection of you. Angel Haamiah is here to support you in knowing yourself as a spiritual being, one with all of creation. Angel Haamiah will support you in being your authentic, spiritual self, choosing to do what is in the best and highest good for you and those involved in the situation. You are reminded that Haamiah is available to you for additional strength of heart, mind and spirit, as you make important and challenging decisions. We thank you for taking time to be with us today. We appreciate your love, light and strength. As we are with you, we feel the stress that many of your are experiencing; this is not new. We understand that these feelings are caused by one feeling that they are not in control of their life; have not enough control over their finances and relationships in their lives. Life seems to be speeding up and you are doing your best to keep up with the seemingly endless demands placed upon you. We Angels ask you to still yourselves, breathe and quiet your mind. Set your mind/ego to the side and focus on your breathe; silently call on us to be with you, right there, whether you are standing, sitting, working. Ask us for emotional support, (this will come to you energetically) physical strength or energy, or help in seeing the bigger picture of a situation that has your heart in pieces. We promise we will be there, helping you as you requested. Because you have free will, we await your calls. For those who believe in us and accept Angels into their life daily, we are with you; however it is in your faith in us that you ask for this support----this is you trusting and working with the forces that God Creator has given to you. Your trust in us strengthens our relationship with you and further enhances your souls’ spiritual growth. And that is why we are all here. With love and admiration for you. The sun comes up and you begin another day. Light fills the sky, birds chirp and slowly, bit by bit, your new day begins. Each and every aspect of you, along with all of humanity, are part of the life force that is one with Creator, sunlight, the air, water, flowers, trees and the mineral and animal kingdom that create your environment. How precious you are, and how blessed you are to be living on such a vibrant planet at this time in your evolution. Just as there are countless stars in the sky, there are just as many angels here to assist you; earth angels, guardian angels, planetary angels to name a few. All of these life forms, though unseen by the human eye, are here for your well-being and development. Call upon the angelic realm at any time. We know you personally and will share your joy, triumphs, worries and troubles with you. With respect and love for you. We would like to focus on Joy! For you to experience Joy in your day; feeling that inner connection between yourself and that person, place or thing that brings you good feelings, a sense of wholeness, and an inner happiness that you feel right at that moment, coming from deep within you. These feelings that awaken you to feeling more alive and one with life. Flowers, the weather, the summer activities, friends together, vacations, being outdoors; whatever it is that brings an inner sense of comfort and happiness to you. Joy is what we wish for you, and we encourage you to see it + find it everywhere you are. Feeling Joyful helps your energy expand-----you feel lighter and your mind allows other ideas you hold, to become “possible”; it boosts your confidence and you have a larger perspective on your life.” Experiencing more Joyful moments will open you to more appreciation and gratitude about yourself and others in your life, and live more in the present moment. If you focus on finding happiness and Joy throughout your day---we are certain that you will find it, and this will be beneficial for you. May you have a peaceful and Joyful day today. We remind you that as Angels we are always here for you. We are here in presence and as a state of mind. We Angels are here energetically, to be with you physically, offering you physical strength of body. We are here in Spirit supporting you emotionally, and spiritually; helping you to endure that which you are experiencing, both with your mind, heart and soul. It is through your openness of your heart and (invitation) calling upon us that allow us to work with you. It is you inviting us into your daily life that brings us closer; and it this working together, that we become a stronger team, and you become spiritually stronger – developing- growing- realizing and feeling more one with God Creator. This is your path to remembering yourself as a Spiritual Being. Through your spiritual development you begin to see and understand your life through the eyes of God Creator. Understanding some of the answers as to why you are dealing with some of the challenging situations in your life; what you are learning through these experiences. In all of this we are here for you if you allow us to be. You know us as your Guardian Angels, Archangels, and helpful angels that are around to help you with matters large and small. We thank you for your faith and trust in us. Ours is a two way partnership. Our efforts together enable us to succeed. There is no thought, worry or joy that is too small, or great to share with us. We encourage you to call upon us at any time; in good times and bad. how you deal with your emotions. With each breath and thought lies the opportunity for you to consciously choose your thoughts, actions, intentions and emotions. This truly takes living and being aware of you----here and now. In your nano second world, not rushing into unconscious reactions, your ego mind and subconscious belief system----but instead, choosing to slow down, think, and make thoughtful decisions---realizing the spiritual consequences of your choices; is what living by discernment is all about. Discernment is about knowing from your inner most being—your intuition—and your heart; what is right and wrong for you. To know what is really in your best interest. It is about living honestly, lovingly, with compassion and with forgiveness, for yourself and others. We Angels of Discernment are here and always are available to support you with personal strength, to make better choices for your self—you’re soul. Sometimes this means giving something or someone up, not being right, or being the better person and just doing the right thing. Although this may be difficult for your ego to handle---your soul will grow in light, wisdom and be more balanced. Your goal for soul development this lifetime is our opportunity to work with you. You have much love and support from God Creator and we Angels. Call on us and you will learn how true this statement is. May you live with spiritual clarity, bringing you peace and love. We angels are here to support you on your path of spiritual growth and soul development. We understand the challenges that you deal with every day; sustaining yourself and doing your best to live harmoniously with others. There are some here who have a capacity to be of service to others; in helping freely, as an act of kindness; and expect nothing in return. This may be called charity or acts of service. In these acts, one gives from their heart. You are only able to live one day at a time, one moment at a time. Living this way aides you in living consciously----and helps you to see more clearly what is actually happening in your life now. This is called being present. We angels are in gratitude for all those who share their talents, strengths and kindness with others; humans, animals and all the elements that make up earth and the universe. We are here to support you in your times of vulnerability and stress. Call upon us as you need energetic and emotional support. Please remember that your life matters. You matter; and it is for you that we are here. With love and appreciation of you. As your hearts and minds are open to the new possibilities of your New Year, we invite you to see yourself as we angels know you; as divine beings full of love, strength, determination, a student of earth life, here for the experiences that you choose, to balance your Soul. We remind you that every day of your life holds the opportunity to experience new thoughts and beliefs; the chance to release limiting thoughts and painful memories. Every day is a gift in that you choose your thoughts and actions. You think—you create. It is in discerning the patterns in your life; which ideas and actions are positive and productive, loving for you and others? What brings you joy and fulfillment? How can you create more of this for yourself? What beliefs, memories, actions do you possess that create fear, sadness or anger in you? These are the aspects of yourself that need to be honestly examined; what have you learned about yourself? Releasing limiting thoughts and memories will give you a new perspective on yourself and your life. Your discernment of personal truths will empower you to begin feeling, understanding and living a more balanced and meaningful life. We Angels of Discernment, Wisdom, Mercy, Forgiveness, and Love are all available to you each moment of your life, ready to support you in your Spiritual development. Our purpose is to support Humanity. We celebrate with you this December in honoring Creator and humanity’s Spiritual Awakening on your Path of Ascension. You are reclaiming your oneness with Divinity, and understanding that you are truly a spiritual entity experiencing life as a human being. The year 2013 began the time of humanity’s mass ascension. The solar energies that are reigning down upon earth are affecting not only the weather and earth energy, but you as well. These new solar lights/energies assist you in opening and trusting your intuitive thoughts and impressions; gently offering you guidance from your Super conscious Mind---High Self---Soul wisdom. Following your intuitive (and internal guidance,) your “gut feelings” will give you greater clarity and direction in your life, than working through thoughts from one’s ego. Consistently choosing to do the right thing, rather than doing what is easy or self serving. Meditation greatly aids in this focused development of your Souls’ awareness and wisdom. Your consciousness is expanding and knows that humanity is past the point of living life only looking out for oneself. Today’s technology keeps you current with world events; i.e., what is happening to others on the other side of the world, minutes ago. This is Global consciousness. How do you stay centered--balanced through all of the personal challenges and worldly events that confront you daily? By focusing inward—staying connected to your Soul; listening to your intuition. Stop rushing—slow down—create consciously a space for you to breathe; close your eyes and focus on your connection with The Divine and your Soul. Silently allow yourself to feel this oneness; breathe, ask for the clarity and what the best is for all concerned in this situation. Wait for the response. Trust the information that you receive. We are grateful that so many of you are doing this; we encourage all of you to trust us in working with you. Creator, Angels, Guides and Master Teachers* are all available to work with and support you. Call upon us—partner with these energies. You will find that you already have strong bonds with some of them, and find it comfortable communicating with them. With respect and love for you on this journey. As this year is quickly coming to a close, it is time again to celebrate the holiday of Thanksgiving; a celebration of bounty in sharing food, and gratitude for all that one has, with family and friends. It is often during holidays that your emotions are more sensitive to what is occurring in your life in regards to relationships, health and your well-being. The Angel of The East is always available to help you accept your feelings so that you may express them in a safe and balanced way. Allowing yourself to feel your emotions instead of ignoring and suppressing them is in your best interest; this is healthy and nurturing. Being unaware of one’s emotions will have one off balance, and those hidden emotions may explode at times when one is frustrated or angry with another. Self- reflection, honest acknowledgement and outlets such as singing, dancing, exercise, and artistic creation are all healing tools for you to employ. The Angel of The East is always available to support and comfort you in your healing process. When you accept your emotions and allow them to be gently acknowledged and released, you are honoring and accepting yourself. As you honor your feelings, you grow and mature spiritually; and become happier and more compassionate with yourself. The more you accept and understand yourself, the better able you are to understand and accept others. With love and acceptance of you. With every breath you take you choose life, and agree to participate in living here on Earth. The choices that you make moment by moment, as to how you feel, what you are thinking, and the actions you take all impact your life. It takes positive thinking and feelings of self-worth for you to express your individuality in a meaningful and balanced way. It takes personal responsibility to live a balanced (caring) life. Right now you are being challenged by your political leaders who are not being socially and morally responsible for the commitments they made to uphold the principles of respect for human life, honesty and justice in their leadership roles. The Angel of the North’s function is to assist world leaders in rational thinking. You may call upon the Angel of the North, asking to bless your political leaders right now in their decision making process; to be spiritually guided with uplifting intentions and solutions so that they may move forward in unity for the betterment of all they serve. The power of prayer is great. Your intentions of sending healing energy to all government officials will help your government move forward to work through their differences. You each have the ability to make a difference in your and others’ lives now. For the greater good of all, you may choose to send healing thoughts, prayers, and energy to the policy makers and the people of the United States of America. God bless you and all that you do. Call upon these and higher forms of Spiritual guidance to work with you. You are seen and heard .and greatly loved. Have you noticed how the energy here has become more intensive, more palpable? Events seem to be happening in extremes, either very good or very negative. This is evident by the fires in the West, the chemical attacks in Syria, and in the increasing number of meltdowns people are having right here with you; argumentative, aggressive and deceptive in nature. What does this mean? What opportunities does this bring to you? The flaring of tempers, aggressive behavior and unethical practices are all ways in which the individual(s) is expressing their true nature. This person believes that they are better than another and in lack. These individuals are not connecting to God/Divine Source for if they did they would be working for the good of all. Encounters with fiery individuals are your opportunity to see that they are limited in their experiences, beliefs and scope of knowing God. It is at these times when your spiritual wisdom opens for you to see the whole picture; hold off on judgments and to ground and balance yourself so that you may stay present in the moment. These are tests of your spiritual nature. Can you see the frailty and vulnerability of the offender? It is with love, understanding and patience that you do not take offense with this person. It is at these times that silent blessing be sent to them, the situation and all involved, so that a peaceful agreement may be reached now. We are Earth Angels and Guardian Angels here to support you on your spiritual journey. We love and respect you for your spiritual dedication, awareness and growth that you are living. Remember that we and other angelic beings are here to support you on all levels of existence; so long as you invite us to. Ask for help, stay open to receive it, take time to be silent in God’s Grace for self-healing and balance. Each of you is worthwhile and stronger than you realize. Know this. Living in a physical body with a material world surrounding you, one’s life is built on what you see, feel and comprehend in the physical. Living life is action and intention based. Daily life takes planning, preparation, doing, receiving, processing; these all deal with your mind and your physical being. Faith is something that no one can give you; you have to develop it for yourself. Faith helps you to wait, endure, and understand the lesson you are experiencing, so that you may learn and grow on a soul level. Through your tests of faith you grow spiritually. As you come through these challenges you grow stronger in your understanding of yourself, life, others and God. We are the Angels of Faith and are here to stand with you in your times of doubt and trials. Angels of Faith will be with you whenever you call, asking to, “ …help me be strong and have faith in myself” and through the circumstances that you are bearing. We come today speaking to you about Grace. You create grace from the acts/works that you do, in works of charity and service to others and in forgiveness. Grace comes to you as energy; physical or emotional strength, peacefulness and comforting solace; depending upon what you need at that time. You may create grace and save it, held by your soul, and when needed, call upon that grace to uplift you and help you with insights, understanding, forgiveness and or strength to overcome your trial. You may use your grace by bestowing it on others, to support them through their difficulties. The energy of grace helps you on all levels; mental, physical, emotional and spiritual. Divine Grace is given to you from God simply because you are loved and are always one with Creator. It is through your communication and faith in God that you may ask for more grace—strength—from God, to help you understand the other side of the situation, help you forgive yourself or another, help you to trust yourself to release old habits or beliefs that are limiting to you and others. Grace gives you additional strength to let go of the old and embrace new positive thoughts and actions. We angels urge you to call upon us in supporting you. We are here to be a bridge to help you know your connection to the Divine and all of creation. With thanks and appreciation for you. God Creator has multitudes of angels that assist Humanity and the Earth in many ways. We angels are here to assist you to feel the life force – energy within your body and aid you in developing a healthy relationship with the Earth. We angels may help you in “grounding” yourselves in physical reality. By grounding yourselves you open your senses to experience fully the world around you. By using the earth elements to ground yourself, you are allowing your spirituality to take form; helping you to make your hopes and dreams a reality. By grounding yourselves you are staying more in the here and now—present moment. Doing this keeps you focused on your physical being—your body and life situations; to nurture and sustain it in healthy ways; diet, exercise, rest and your spiritual nature. When you are healthy you are better able to feel happiness and satisfaction in your life. Your peace of heart and mind brings gratitude for yourself. Thankfulness for you, your life and all that you have learned and grown from this lifetime. Your gratitude sends out healing energy to others (humans) and to all of life; animals, plants, air, water. Your wellness/balanced energies help Earth energies to be healthy and balanced. We encourage you to call upon us when you need support with your physical well-being; whether it is in sticking to a new diet, exercise program, better care of your body, or in needing more love and healing energy for your heart and soul. We love you and are here to support you in any way that we can. Please talk to us as needed. We take no holidays or time off—we are here in love and support of you always. Thank you for this time together. We thank you for being with us today. We understand that your daily lives offer you challenges as well as opportunities for loving relationships, support from family and friends and those who are close to you. We ask you to remember the importance of self-care; making time to reflect on areas of your life that are not in harmony with you; such as people and or situations that are stressful for you. It takes personal strength to honor yourself in searching for the greater meanings of the dynamics between yourself and others within your relationships. We ask you to be gentle with yourself, no guilt or blaming; you are releasing old perceptions and allowing greater aspects of yourself to develop. You always have free will to review, revise and change how you see and understand yourself and to make changes in your life and in your beliefs. This takes personal strength, courage on your part, having faith in yourself that you can handle change. Being able to change your mind, your perspective, if that is what is best for you. This is being flexible—adaptable to life. This signifies growth on your part. No matter what types of challenges you are faced with, know that we Angels stand with you. We cannot change your mind nor can we change another person, but we are here to support you and guide you the best that you allow us to. It is always your choice. We are here with love and respect for you and your souls’ growth. Call on us whenever you require comfort, support and love. We come today to explain to you the many ways that angels are here to assist you. The Angels of Trust work with your High Self to help you develop a trusting attitude regarding life; especially when dealing with stressful and challenging situations. When you are experiencing tough challenges that shake your faith and trust, call on The Angels of Trust to infuse in you strong, clear feelings of peace, confidence, and clarity in your decision making. This is all part of trust; seeing yourself making right choices for yourself and your family, and living as a balanced, compassionate human being. We are here to be of service to you. Please remember this. Call on us as you need our support. Thank you for once again sharing your time with us. As God has given you many angels to support, assist, and guide you there are a few angels that you know by name. I am Archangel Gabriel and I shall be working with you today. One of my abilities is in working with you in understanding and delivering clear messages, information for you to consider and or to share with others. I help those who speak, teach, and communicate ideas so that they may do this with clarity, truth and integrity. I am here to partner with you to understand clearly your issues such as limiting beliefs about your personal worth, personal responsibility, fairness, and your connection to The Divine. With thanks for you and your life’s journey. We thank you for sharing your time with us this day. As Angels we are here to support, guide and share information with you to the greatest extent that you allow us to do this. We are here and know your happiness, joys and love that you have in your lives. We also hear, see and understand your self-doubts, fears and sorrows that you experience. If you are unhappy with your life, part of you is unhappy with yourself. The ability to like/love yourself and to live a peaceful life with others is a right that you have been given by God, because you are a part of God. From the love that God has for each of you, you were created. That same love is inherent in you and is a powerful tool for you to use in shaping yourself and your life. It is time for you to realize your true strengths, love, equality, non-judgment, they are all part of what you are made of. You are reminded to focus on your best attributes and develop them. It is time to realize and release the limiting beliefs that you have regarding yourself; these are personal tests. Work on nurturing attitudes of gratitude and fairness, this will assist you in attaining greater harmony in your own life. We ask you to pray for spiritual strength, creating quiet time to feel and strengthen your connection to God. As you feel peace and compassion in your heart, you may multiply this love and know this is who you are. You do make a difference in this world. It is time to be courageous and be the light and love that you truly are. With respect and love of you, we are in gratitude of this time together. We thank you for being with us today. We speak with you about Eternal love, this is what you feel in your hearts and what you remember as feelings for someone you have loved. Eternal love is what you feel, when, “you know you are in love.” This energy of love is always with you and is indelible in your souls and all of your being. Feelings of peace, harmony, self-acceptance and unity are all part of eternal love. The feelings and memories that you have of loved ones is always with you---you may recall them by meditating or taking time to think of these individuals. It is your choice to keep love alive within your heart. With the feelings of love we feel connected to others, to life itself. If you are feeling the loss of a loved one, or disconnected / out of balance within your own life, it is time to call on the Angels of Eternal Love to support you in recalling your loving relationship with yourself, God, and to others. Your original bond with God was created with pure love; this is still intact and yours to access. See yourself one with this divine energy; breathe it in and accept it. Allow yourself to heal in this energy. Eternal love aids you in accepting peace within yourself for who you are. With Eternal love for you and deepest gratitude of your working with us. Thank you for our time together. The Angels of New Beginnings may also be known as the Guardian Angels of Children. These angels protect new life, anything that is in the process of growing that care, nourishment and love are needed for its healthy development. This applies not only to mothers, children and caregivers. It also applies to your inner child; that part of you that seek safety and love, honoring new beginnings, projects, relationships or new ideas in your life. By partnering with these angels through heartfelt communications you are asking for strength and support throughout your new endeavor. You may ask for guidance, nurturing, and inspiration for all aspects of this new experience. Be open to the ideas, promptings and feelings, (some of forgiveness and or gratitude) you will be receiving. Act accordingly. Seeking acceptance, wisdom and protection for yourself and all those involved in your new journey; the Angels of New Beginnings are always available to support you in times of self-doubt, loneliness or confusion. Call upon them. Sit quietly and ask for Divine guidance from God and support from the angels; this is always there for you. This process will uplift you and aid in releasing pains, fears and old sorrows that have held you from being your highest and best possible self. Invest the time and energy in your development of self and your soul growth by conversing with God and the angels for this is your gift and right. Empower yourself with the blessings that are available to you through your requests and spiritual development. In your personal and spiritual blossoming come the refinement of your soul, and the wonders of how joyful you and your life may be. May you be blessed with strength of heart, love and gratitude for yourselves and all of life in this most holy season of the year. Blessings to all. With gratitude and love for you. We are grateful to spend time with you today. We understand the trying times that many of you are going through. We share with you information regarding the Angels of Mercy. Their function is to bring mercy into your lives and hearts. You are asked to call upon them whenever you feel lost, in despair, or are confused as to what actions to take in difficult matters. With your heart and mind open your intension is of partnering with The Angels of Mercy. By doing this you are growing your faith and are being given additional emotional, psychological and or physical strengths that you require right now. These angels aid you in seeing the larger picture of what is happening in your life and assist your feeling safe enough to allow yourself to understand your conscious and subconscious underlying beliefs and actions that created this situation. The mercy comes in forgiveness of yourself and in increasing faith in yourself that you are strong enough to get through these stressful experiences. Being open to and aware of this guidance and allowing you to flow with the situations and solutions that will come; by understanding that your open heart and loving nature create harmony in you and others. Trust that you are receiving clarity and personal strength from God in your times of struggle. Have faith in knowing that you’re expanding your spiritual growth, allowing forgiveness of self and of others, and allowing greater understanding of your connection and responsibility to all of life/living beings on this earth through these life lessons. With continued love and respect for each of you, we are yours. We thank you for allowing us to be with you again today. Our message is to remind you of your own spiritual nature, personal strength, personal wisdom, convictions, morals, your identity. To ask how do you want to live your life and be in relationship with God, yourself and others? At times it may be difficult to be the better person that you are capable of being. There may be personal or financial situations that you must deal with that push you to your limits --- It may be difficult to be open, understanding, flexible, compassionate and understanding to someone else or the situation you are living through. It is exactly at these stressful times that you are being given the opportunity to slow down, reflect on the best action to take. Asking yourself, "How would I want to be treated in this situation?" Are you able to look at the other side of this situation, from another perspective? Realizing that you have a choice in how you view the event and that the better way to handle this stressful situation is to step back and be as non-judgmental as possible. Do your best by creating a solution that is right for all parties. To do this takes spiritual insight, willpower and self-control. Your life contribution on Earth matters and is impacted with each thought that you create and every breath that you take. You are valuable for being you. How you live and what you believe and create effects you and others. We remind you that Archangel Michael is the angel of strength; physical and emotional, available to help you move through personal fears so that you may live your life doing what is right for you at the same time honoring others. Call upon Archangel Michael to help you to have the personal strength to be kind and loving of yourself aiding your spiritual development. Angel Daniel is available to help you with forgiveness of self, to let go of self-judgment, blame and criticism of others. We urge you to call upon these and all angels to help you when you feel weak or lost. You are stronger than you know and you have the potential for great healing of yourself and others if you take a stand to be your best right now. Thank you for this time together. May you always know and feel that you are greatly loved. Thank you for once again for joining us today. One of the greatest gifts you have as a human is your heart. Besides the physiological functions of the heart in keeping one alive, the heart is your access center to the wisdom of your Oversoul. Your heart is your guide to the highest spiritually balanced intentions and actions you may achieve. With relationships, it is in honoring and supporting yourself and your relationships with others that your heart guides you to know and act upon from the true goodness that is inheriently your High Self. Your heart wisdom knows the thoughts, actions and deeds that are truly aligned with what is for your best and highest purpose in this life for your High Self's growth. You may feel this at times as intuition. Heart wisdom works with your mind, body and emotions. When loving, compassionate thoughts and beliefs dominate your conscious awareness your emotional wellbeing is stable. Your overall being is graced with feelings of empathy and being consciously aware of others and their needs. You will become more intuitive to the people, animals and events in your life. You will instinctually know the right course of action to take, even if your mind-ego may be more critical and judgmental of the person or situation at hand; you know you have a choice in your response. We remind you to trust your heart and intuition in all that you do. When your mind and heart are at odds, wait, be still, and ask again; or do nothing until the response feels right to you. Trust your heart. Do what is right in all situations--what you create is what you will live with. Acts of love and fairness will bring you more of the same. Do the right thing the first time and you will succeed. Trust your connection with God and that connection will strengthen. Praying is conversing with The Divine. Know that we angels are here in support of you; call and speak with us at any time. With admiration of you we bless you and this time together. With thanks for you. Thank you for again allowing us this time to be with you. We speak with you today about finding your center of balance in knowing your Oneness with Creator God. Although you are here in a physical world, you have for ages lived on earth experiencing duality and polarity in all matters. Right vs. wrong, light vs. dark, man vs. woman, you vs. them. These beliefs are of lack and seperation; this has been your self test. As you are now into mankind's new times, with new light energies coming to you to assist you in creating your new light bodies, it is time to be your true spiritual selves. This is what this new time is about. You chose to live on earth to have the opportunity to make choices in your lives that reflect your spiritual oneness with all of life. To share with others your kindness, compassion, love, forgiveness and by being non-judgmental; being the greater whole and balanced being that you are, always connected to Creator God. It is time to remember and live this truth. Would you intentionally hurt yourself? No. Bigotry, selfinshness, elitism, pollution all say that one cares more about his/her needs then the good of all of life. We angels are here to remind you to see/know yourself as one with ALL OF LIFE. We encourage you to let go of old thinking and beliefs about seperation and lack. Embrace yourself as an energy that is affected by everything that happens in the world. Meditate, go into the silence, listen to your inner feelings to honor yourself and others more. Find community with others, see yourself reflected in others. It is your desires of a united and fruitful life for yourself and all of humankind that will create this reality. It is time for you to see your life as fruitful and your heart, mind and spirit in harmony together. Mankind has never had this much angelic and spiritual assistance available to them. We are here; call upon us and your Soul Star energy to help you live your highest and best good. We send you blessings and are grateful that so many are awakening and living your true spiritual selves. We thank you for all that you do. Good day. What a glorious fine day this is. On a day like today it is easy to feel in harmony and that life is blossoming all around you. As you acknowledge the beautiful blue sky, the gentle warm breeze, and the sun filled day, it is easy to look outside and find natural beauty. Now what about you? In self-reflection, are you able to discern your own beauty? We are not talking about physical beauty, but yes, please count that as a blessing of yours. Do you have a temperament that is one of cooperation with others? Do you have (some) patience to listen to and care about someone else? Do you share with or help others? Are you thoughtful of the welfare of others? These are all aspects of your intrinsic beauty, the beauty of your being. Right now, be still and reflect on today; have you shared your time and talents with another? How have you supported or comforted another? Have you extended kindness without the need to receive something in return? Giving of yourself beyond your own wants and needs are your soul working toward the "highest and best good" for you and another. Living your soul wisdom is part of your inner beauty and oneness with all of life. When you give of yourself you are sharing your spiritual wisdom; there is love, service and unity in this. Please remember that you are an intrical part of all that exists, and that what you do, think and how you live your life affects all of life as you know it. Thank you for daily doing your best to live as a spiritual being here on earth. With love, respect and admiration for you. We are here to support you; please call upon us as needed. It is once again with gratitude that we are with you this day. We speak today about peace of heart and mind. How does one achieve this? Your peace of heart and mind comes from both being connected, both being in alignment with each other. One’s intent, what you hold in your heart as a truth, is what carries you forward in your thoughts and deeds. Are your heart and mind at odds? Do you think (believe) one thing, yet feel uncertain of its truth? What matters most is what you hold true about yourself. How do you see yourself? What do you believe about yourself? Do you know yourself to be worthy of unconditional love, forgiveness and self-acceptance? The answer is an unquestionable YES from God Creator. Your essence is of Divine love and light from God; always one with Creator. It is your journey to experience yourself and your life with your current personality, strengths and weaknesses. It is your choice to listen to your gentle and intuitive knowing from your soul. These knowings are inviting you to accept your true self as an evolving spiritual being embraced and one with God. It is your choice to accept and love yourself as one with Divinity. This brings you peace of heart and mind. The truth is you are loveable, worthwhile and one with all of life. With this comes the responsibility of upholding high moral standards for your thoughts and actions. Living deliberately you create balance for yourself and others, peaceful and supportive. Living consciously supports your highest good and your soul’s growth. Thank you for this time together. Please call upon us at any time for continued support and comfort. We thank you for welcoming us into your hearts and minds this day. As today is just days away from Easter Sunday, we ask you to consider the message of Easter. Deliverance and rebirth of one’s spiritual being. What burdens lie upon your heart and mind? What aspects of your life do you want to change in a positive way? Contemplate on this; what changes would you need to make, within yourself to do this? Do you seek to change your thoughts and beliefs, thereby allowing yourself to open to new ideas? Do you choose to allow yourself to let your guard down, allowing yourself to feel your emotions, to be in better attunement with yourself; head-heart-and spiritual self? Or may you decide to have control over your emotions, so that your emotions do not rule you? Owning your feelings is a healing tool. Emotions illuminate our commonality to each other, connecting one to all of life. This is literally like, “walking in the other person’s shoes.” This will bring you clarity, understanding, empathy, and ultimately forgiveness of YOURSELF. Understanding your own issues illuminates the realization that others have their own fragilities too. This offers you the gift of non-judgment. The gift of allowing. The other aspect to feeling emotions is to have control over them. To understand that what you do and say has an effect on yourself; (your health), and others. Treat others as you would like to be treated—“The Golden Rule” for mankind. Create balance in your life. This may include time alone in meditation, prayer, being and or working in nature, sharing your talents with others, giving to worthwhile charities. Easter and springtime are about rebirth. What changes do you choose to make in yourself? Begin today. We angels are here to support you in love and gratitude for who you are. Please call on us as needed; we are always here with you. Thank you for this time together. May you enjoy the beauty of nature that is all around you. We thank you for spending time with us today. Throughout time humans have created art to capture the images of Angels in order to relay a story and express the goodness, protective nature, gentleness—(essence) of angels. From prehistoric man’s cave art, to glorious works of art by Michael Angelo; books to bumper stickers have been created to bring one’s attention to us and our interactions with mankind. Angels have been named, ranked and labeled by specific deeds and healing aspects that we possess. We are grateful for the ever growing awareness of us; and one’s intent to know us more intimately. We want to be very clear in our purpose here and how you are always able to access us. 1. God Creator sent Angels on Earth to be a support system for each of you. An ally to help you to connect spiritually with God and your High Self- Soul; which is always one. We are a source of energy and strength. 2. Part of our job is to relay messages- information to you to help you daily, in all matters. To help you have the personal strength—will power, to be the true, compassionate and forgiving soul that you truly are. To aid you in seeing through the illusions that earth, having a human form, one’s ego and mind creates. 3. Partnering with your Guardian Angel is the first step. At least one angel is with you always, from your birth until you transition to spirit. Angels are unable to assist you, unless you acknowledge them and ask them to work with you. Be open to communicating with angels; asking for guidance. 4. There are no prescribed methods in communicating with angels. What is comfortable for you is what will work best for you. Think or talk with us; that is what really matters. Once you have begun your dialogue, look for signs and answers to this connection. It may come as a new idea, feelings or a connection. 5. As you work on your angelic connections, you are opening to experiencing and accepting more of yourself as a spiritual being. You are one with God Creator and all of life always. This is so. This is sacred. Your thoughts, intentions and deeds matter. We each have a role in creating our lives. Know that you are greatly loved and appreciated for who you are. You are evolving and are key to this world’s life. You have so much help here for you; open your heart to feeling and knowing the support and guidance that is within you. As you do this, you are opening more to your own spiritual wisdom and truth. Mankind’s’ opportunity is to learn through your personal challenges and live your spiritual oneness with trust in your divine nature of love and forgiveness for yourself and others. With admiration and much respect for each of you, we thank you. We are grateful to be with you again. We ask you to permit yourself to be true to who you really are. This is not about your name or what you look like; it is to truly allow yourself to know your soul within you. Close your eyes. Breathe---. Allow yourself to feel your energy, as it runs through your chest, arms, and legs. Feel your being as you sit here. Allow yourself to be “alright” with what you are sensing and feeling about the physical aspect of you. Remaining in this calm and quiet space, acknowledge all of who you are. You are a spiritual being, living and learning about yourself and God through your experiences with others and all of life. Your personality, spirituality, intelligence, sense of humor and idiosyncrasies are all aspects of you that make you unique. Do you like who you have become? Are you living your God-essence; with consideration and care of yourself and others? If not, why not? Does your ego get in the way of being better than another; or have painful, old memories that convince one not to be kind to someone because of past injuries? The greatest task in life is in being true to your soul and its oneness with God. That is what the great teacher, Jesus lived. Your thoughts, beliefs and actions create you minute by minute. You are able to change your mind, and your perspectives on life-- this is called free will. You are solely responsible for yourself. You are capable of being the balanced caring individual who respects oneself and all of life. In doing this you are healing your soul and assisting the world in living a more compassionate existence for all. Thank you for this time together. Remember that we are here and in support of you and your lives. Call on us at any time to bring additional support to you. With love and appreciation of you. We are grateful to be with you again. We speak to you this day about finding joy in your life. In the people and experiences that you have throughout your day. The best way to do this is to take nothening and no one for granted. You are willingly here to experience life to the fullest. Being your best is living with dignity and respect for God Creator, yourself and all of life. It is in your thoughts, words and actions that you continually create and refine your being— your soul’s energy. It is through your eyes, ears and senses that you feel—sense and learn. Having respect for others and all of life, societal issues, nature and the environment, comes appreciation and gratitude, this is how one matures spiritually. What do you see? The needs of others less fortunate than yourself. What do you do about it? Open your heart to send blessings, loving thoughts and aid if possible, to the individuals / situation. What do you hear? In a phone conversation with another, do you hear the fear or sadness in their voice? What do you do about it? Open your heart to be supportive and send blessings, loving thoughts and aid if possible. What do you know? That by agreeing to live on earth at this time of transition for humanity holds the responsibility / opportunity for you to live your life to spiritually higher standards. To understand that everyone and everything requires love and compassion. If you take this view and do your best to live by it you become a part of the solution, a healing energy for yourself and others. You will grow in personal strength of heart, mind and spirit. This is why you are here; for YOUR soul’s experience. YOU are a gift. YOUR life here is a gift. YOUR experiences, good and difficult, are gifts. You will find joy in living this wisdom and in your spiritual growth. Remember that angels are here with you to assist you as you call upon us. We send you love, peace and clarity to support you. With admiration and great love for each of you. It is with much happiness that we are able to speak with you this day. Thank you so much for inviting us into your festivities. We speak with you today about friendship and love. As a group you are living the meaning of friendship and love. Being considerate of one another, being caring and respectful. Meeting regularly to be with each other; this supports your whole being and at the same time is nurturing to all gathered with you. Whatever your objective is in meeting, the intention is the same, genuine gratitude and bonding for you and your fellow friends. This too, is the relationship that angels would like to achieve with each of you. Friendship, as in knowing that we are always here and you may count on us at all times. Love in that we deeply love and respect each of you for the unique souls that you each are. We hold no judgments of you; we are here to support and guide you, as you allow us to do this. This is where our relationships with you come in. By inviting us into your consciousness- your lives, we are better able to connect and work with you. We invite you to talk with us, think of us, and ask us for assistance as needed. Tell us your joys and sorrows; we are here to partner with you in support of your spiritual growth. Know that you are never alone; God has given you angels as a gift of spiritual support. Blessings to you and your families. May you all have peace of heart and mind this holiday season. We thank you for our time together. We wish you happy holidays and remind you that, “Tis the season of reflection.” No matter one’s age, this holiday season comes with glitter, bows, festive gatherings and gifts. With great excitement and activity for the holidays comes shopping, holiday decorating and preparation of one’s home. As you check your “to do” list, and schedule your outings, you are encouraged to reflect on your personal gifts, the personal and spiritual growth you have attained this year. You are the reason that we angels are here. How have you grown? What opportunities and or challenges have you faced? Do you recognize your own growth as far as a change in attitude or a change of behavior within yourself? Did you have an issue that genuinely challenged you, which you have worked on this past year? Possibly you are still exploring that challenge; that is fine. Are you taking stock in yourself; reflecting on who you really are, what you believe about yourself and looking at what is and what is not working in your life? It takes personal strength of character to do this. It takes personal faith in yourself and in God that you are strong enough to accomplish this. You are worth the effort. Some of your greatest challenges are in developing your own potential. Please continue to ask for guidance from God/ Divine Source and the angels in all of your efforts. You will receive grace for emotional and spiritual support to continue to challenge/ expand yourself to be introspective and open to new awarenesses as you release old hurts and beliefs that no longer serve you. Your soul/ High Self know that there is a higher standard that you may each obtain for yourselves. This is your challenge and opportunity in this lifetime. We know you each as unique and strong souls here to experience the love and compassionate potentials that you are. May you know your oneness with God Creator and all of life. Blessings to you this Holiday Season. May you shine forth your loving hearts onto yourself and all others. We recognize that many, if not all of you, are facing challenges of all kinds in your lives. These are times of change of paramount magnitude and importance for humankind and life on earth now. For most, life has become hard to live. Right now most individuals are in need of tenderness, personal acknowledgment and compassion. You are living now to assist in creating new paradigms for spiritual, conscious living. You are being asked to open yourself to God; you inherently know how to love and respect yourself and others. The old man-made rules for living, business and government are dysfunctional and have proven themselves to be prejudicial and unjust. Now is the time to embrace spiritual teachings and its wisdom of living in harmony with God’s universal laws of love, harmony and balance. v Accept that you are one with God at all times; you are a part of God and all of life, “all that is.” The thought of separation from God comes from your ego, fear, in one’s mind. Realize this and allow yourself the peace of heart and true unity that is always yours with God. Be at peace with this concept. v Take the time to sit in the stillness/silence with the intention of being “one with God.” Allow yourself to be completely embraced by the energy of God, which is love. As you do this you will feel complete peace of heart and mind. Recognize as you finish this sitting how “whole/complete” you feel. You will want to experience this serenity again and again. Meditation, walking, and creating assists in this process. v To feel balanced and whole it takes positive/loving/caring thoughts and actions by you, in your daily life. v Honor God, yourself, and your fellow human beings by treating others as you would want others to treat you. These actions need to be extended into your home, workplace and throughout society. v Do not judge others; you do not know what they have lived through. Be responsible for oneself and one’s actions. This includes taking care of the environment. v Do works of charity for others; say “hello,” and or share your time or talents with another. Basic human rights are truly an extension of caring for another. v Treat everyone and everything with respect, as all of life is connected. What you do to and for others, you do to yourselves. We thank you for this time together. We support you on your journey; please call on us throughout your day. That is the purpose of our being with you. Thank you for being the strong souls that you each are. We would like to speak with you today about grace. Grace comes from God as a source of energy/power for you. Grace comes to you and it is you who decide if you will accept it. Grace is additional support/energy/strength that a soul earns by works of charity, kindness, and forgiveness. It is also earned by one’s spiritual growth. Grace is given in acts of forgiveness to yourself and or another. Grace is the natural tendency you have to help another. Grace is your ability to think of someone else’s needs, before your own, and act on them. Grace is the inner strength you have in looking at your problems in truth and accepting responsibility for them. Grace is earned and available to you; ask God for strength and clear spiritual sight in all matters. You will “know” what to do; you will be guided. If you are spiritually strong, you are a great example to others. Know that you are earning grace in all that you give to others. That your good deeds bring you grace and graces’ strength/power brings you peace of heart and a stronger connection with God and your High Self. With love and light to all. May you know God’s infinite love for you now and forever more. With thanks for our time together. We are inviting you to remember your sacred worth. You are a vessel of infinite life and love. Every bit of you comes from the energy that is God - Universal Love. Experiencing life as a third dimensional human being is challenging as you came to experience life not remembering your origin; not remembering yourself as a spiritual being, always one with God-Creator. Your humanness has its limitations. One physically tires, needs food, drink, and shelter. Inevitably, one passes on, finishing your physical experience on earth. It is in your day-to-day, moment-by-moment living that you re-discover your true nature, that of a spiritual being. It is in your relationships with others, you have opportunity after opportunity to see the whole picture of what life here is really all about. Realizing the beauty, uniqueness and limitations of one’s physical body, we ask you to appreciate yourself completely. Strive to keep your body safe and whole, loving you enough to take good care of yourself in all ways. Find your own balance with food, sleep and interactions with others. Allow yourself to appreciate beauty and silence, for these sooth one’s mind, heart and soul. As you find your own rhythm and balance, may you open to feeling comfortable in being yourself. In the stillness, feel your connection to all that is: the elements, rocks, trees, each other, all living creatures, the sun, moon and stars. You are part of all that is, part of God in all of the Universe’s majesty. Feel this, as you are able to. Understanding this you will see God in everything. Please know that you are never alone, and are always connected to all that exists in the Universe. May this reminder bring you support and peace of heart. With gratitude for you and our time together. As you stand, we stand with you. You are living in a world of great changes and personal challenges. Humanity is living through a time of social and governmental death and rebirth. The Piscean age is over; it was a time of duality; right vs. wrong, black vs. white, you vs. me thinking. Much of humankind has existed living life concerned only for themselves and their survival. This mind set is over. We are here to remind you that you are not alone in your work here. You always have available to you, and are one with, God Creator, your High Self, angels, guides, Master Teachers, and many other evolved energies as Spirit, who love and support you. When you choose to open your heart to embracing your oneness with God Creator, and all that is, you will experience inner peace and serenity. You will come to experience-remember yourself as Spirit; an un-ending energy of love and light, part of God Creator and one with all that is. It is in returning to your conscious knowing yourself as a spiritual being, and respecting all of life on Earth, that humanity evolves and lives life in a new time of peace and equality for all humankind. With thanks and admiration for you all and your strong souls. We come to you today speaking of forgiveness. Forgiveness of yourself and others. Forgiveness is one of the greatest keys you have to happiness and clarity in your life. With true forgiveness, you allow yourself to release disappointments with yourself and others. Remorse and carrying (keeping) memories of painful relationships and situations does not serve you. This burden limits your perception of yourself and of others. Holding onto old hurts shadows your perception of humankind. Your core essence of light-love is diminished. You may view the world as hostile, and as a result limit the love and self-expression of yourself; thus adding to a non-loving environment in the world. What does serve you is what you learned from the challenging experience.How did you see yourself and the other person involved? What did you assume about the person and the situation? How did your ego challenge your divine knowing? Coming from forgiveness, it is remembering that everyone is created from Creator’s loving energy. You are all equal, no one better than another. You are each unique, no one in the world is exactly like you. It is from relationships with others that one is tested to see and be the God essence that you each are. We remind you that you are all here to love God Creator, yourself and others. The test is in remembering this and living a life of compassion, non-judgment and service to others. We ask you to be an example of a loving and forgiving (human) soul that you truly are. * You are one with God – Divine Source. You are always connected to all of life, from human beings to the plants, animals, rocks on earth to the stars in the heavens. Who you are and what you do does affect you and the world. * You are here to love and have relationships with God, yourself, all humans and all that is here, to grow spiritually as a soul. * You are never alone. You have much support and guidance always available to you. God- Divine Source, Angels, guides, Master Teachers, your human counterparts and those energies in spirit. These energies are here waiting for you to call upon them. Begin to think and speak to them. Be open to new thoughts and inspirations that come to you. It is in being quiet and acknowledging these ideas, that contact is made. Thank your guidance for working with you and when ready take appropriate action. * Know that you are a role model to others. With your commitment to yourself and God, you are daily living a genuine life. Each day you are doing the best that you can. It takes strength and courage to develop your strengths and correct your weaknesses. The rewards of self-mastery are worth it. * Do not doubt your own worth or your spiritual growth. As you continue to open your heart to accept and give more love, kindness, forgiveness, and compassion to yourself and others, you are allowing your High Self to meld with your total being. We thank you for our time together. Please continue to ask for assistance and we will be there for each of you. Greetings to all and Happy Mother’s Day to those of you who are mothers. Mother’s Day is a man made special day, with the intention of the day to bring honors and remembrance of all mothers and those whose role is mother-like in caring for, loving and supporting one’s children and others. The day is a great reminder of all of the love, nurturing support and permanence of these bonds between a mother and child. The basis of the day is love and nurturing support. The essence of God-Creator is love and nurturing support. Every human being has been created with this same energy. You all share in the potential of exhibiting and sharing yourself as love. You are using your true nature (love) when you are kind, thoughtful, caring, loving and forgiving. It is your choice in allowing your divine nature of love to shine through for yourself and all of creation. We urge you to follow your heart and allow your loving self to be kind and forgiving to yourself and to others. This intention and behavior will heal you and the world. With respect and gratitude for you. We welcome you and this time together. Our message this day is of forgiveness. Forgiveness heals not only your soul’s energy it heals your physical energy (body), as well. The act of forgiveness begins with forgiving yourself. Realizing that you judged either yourself or someone else: you formed and accepted an opinion, which says, “the individual was wrong in their actions or words”, and that opinion created a limiting belief for you about that person. Holding anyone in judgment places limits on the way you interact with him or her. It also places limits on how you see and feel about yourself. Coming from your true Divine essence, and from your High Self, you know that everyone is equal: no one soul better than another. However, we are each unique in our experiences and our spiritual development. All of God- Source’s creations are inter-related with each other. To condemn another is to condemn yourself. It is with humility and compassion that we look at our own actions and beliefs and see where we have not been truthful, or have not done our best. It is in reviewing one’s own actions that we learn that we have made mistakes, and have made errors in our judgments. It is in knowing that we ourselves did not mean to hurt another or ourself but that at the time we were weak and living in a non-loving way. Reflecting on this you are asked to see yourself as still learning and developing your loving nature. Know that with forgiveness you are able to change your thoughts and perspectives in a moment. You are able to release negative and restrictive thinking if you allow yourself forgiveness and compassion. Know this. Act on this. Pray, (which is conversing with God-Source) or meditate on this. Do not put yourself down about that which is trite. Take the time to develop self-knowledge, your inner strengths of courage, compassion and thoughtfulness. When you are able to bless yourself and be grateful for whom you are, you will be more compassionate with yourself and others. In this learning is wisdom. Realize that as you are doing the best that you are able to do each day, so is the individual who may offend you. With a forgiving heart and an awakened consciousness, know that others are responsible for themselves, as you are of yourself. You are not able to change others, but you are an example to others. Understand that we are each in our own stage of spiritual development. You are being reminded to love unconditionally and to forgive yourself and others. You are being asked to send love and blessings out to all, in gratitude for who you are. Success! Success! Let us discuss your personal success. Not in the literal way, but to demonstrate a point to you. Each of you are beings of light and love, created by God, Divine Source of All. Each of you are on a journey of great courage and devotion to your true soul essence, the essence of love, being always one with God Creator. At your own pace, you are each experiencing and remembering your oneness with God. This opens your High Self (soul energy) even further, aiding you to be a stronger, self- knowing, and self empowered individual. Living from your High Self – soul essence, helps you to have clearer intentions and helps one to make better choices. These are challenging times that we are living in right now. These trials assist you in expanding your perceptions of yourself to acknowledge your strengths and weaknesses. These challenges give you the opportunity to see defects in one’s thinking and beliefs and give you the opportunity to make changes in yourself now. Life is about love. Love of God, love of yourself and all of mankind. Period. We are at the end time of selfishness, greed, and an eye for an eye mentality. The new time that we are to bring into being is about love and light. Allowing your true souls’ light to guide you into a time of peace and equality for all of humanity. Know that you are strong. You would not be here now if you were not. You are a success right now in your expanding consciousness of yourself, your High Self and your commitment to enlightenment. Stay committed to being the best person that you are able to be. That is what is being asked of you. With many thanks for you and our time together. The earth surrounding you today is shimmering with snow. Sometimes too much, at times just a little, but today you have an abundance of snow. What you do with it and how you interact with it is all by choice. Your earth home is a gift. The air you breathe, water you use, and the ground that you occupy are all gifts. What you do with your gifts and how you view them are conscious choices that you make daily. So too with your life. The books that you read, the media that you watch, the interactions that you have with others, all reflect how you feel about yourself and others. Every particle of your being is God-like. Every bit of you is an expression of your soul manifesting in the physical. That includes your thoughts. What do you think of yourself? How do you spend your time? What motivates you? Are you seeing and feeling yourself as being one with divinity, making decisions that are not only in your best interest but also for the betterment of all? Are you acting in selfless ways in order to stretch your own sense of self, to help another? What are your heartfelt intentions for yourself and others? To grow in spirit? To develop a closer connection with your heart and soul to incorporate more Godliness into your being? To be of service and good will to all people? These are some choices that will lead you on a path of self-growth and spiritual awareness to further open your connection to divinity. With these choices and actions come fulfillment of your heart and soul to fulfill your life’s purpose. Your spiritual growth magnifies the loving soul that you truly are and nourishes yourself and others through its wisdom and beauty. It is in becoming self-less and a living example for others that you become complete and unified with Creator. Greetings and well wishes to you in your new year. It is with excitement and much anticipation that we are here in love and support of you, to encourage you to be the bright lights that you are. We have spoken to you in support of your personal journey to becoming your greater soul’s essence of pure and unconditional love that you truly are. We know that many, if not all of you have been through personal trials this past year. Many of you have had days when it seemed as though you were in a vacuum of despair and hopelessness. As this earth school has shown you, change is inevitable. Nothing lasts forever. That means the good and the bad. How you perceive your circumstances and life situations changes hour-by-hour, day-by-day and month by month. It is with the passing of time that you know of change and growth or lack of it in your life. We are here to celebrate your growth and your persistence in searching for and realizing the actual depth of your soul and the true beauty of each one of you as a human being. It is with gratitude that we are here to join with you in your lessons and your experiences. We stand with you and are always here available for you. Just call upon your angels, guides, teachers and your family and friends in spirit. Do this with an open heart and a genuine desire to learn, grow and become the stronger, clearer and more balanced individual that you may become. We hear you and speak to you through thoughts, feelings, knowing and sometime gentle prodding to help you develop the strength and faith in yourself to keep purifying and melding your soul’s energy with that of All That Is, God Creator. Blessed are you who honor this holiday season. This is a time for reflection upon one's connection with God and yourself. A time to be introspective in reviewing this year and all of the opportunities and challenges that it has brought forth to you. How have you coped with your challenges? How have you dealt with your successes? The paramount question is how do you treat yourself and others on a daily basis? It is in those interactions that you truly see your relationship with yourself and God. God is an intrinsic part of you. As vital as your heart and lungs are to your physical existence the essence of God is always part of one's make up. It is your life force. To understand this is essential in your spiritual growth. Your qualities of love, self-respect, forgiveness, kindness, compassion and humanitarianism all come from your innate recognition that you are part of the totality that is God, the source of all that is. It is in your sharing of yourself that you truly give. As you privately reflect upon your relationship with God, remember that this relationship is composed of divine love of you. Your existence on this earth is your opportunity to be the best soul that you may be, not only for yourself but also to all of humanity. With thanks for this time together with you. Blessings to you. In your daily creation of your life along with your commitments, schedules, concerns, and at times stress, please be mindful that there is also hope, love, caring and oneness with Divinity and one another, that is always available to you. It is your consciousness and your choices that create one's life and one's perspective on it. You decide what you focus on. You decide on your intentions, priorities, thoughts and deeds that make up your day. You co-create your life with your souls' energy and with God Creator. Your trials are your souls' lessons that you have agreed to experience, in order to expand your spiritual awareness and being. Spiritually, your lessons are gifts to yourself as opportunities for soul growth and balancing of your energies to become a clearer channel for oneness with Divinity, from which you are always a part of. It is in being aware of your thoughts, motives and attitudes that shape your life today. Love, compassion and consideration for one another is the cornerstone on which to build your daily intentions and actions. Yours in Love and Light. It is with gratitude that we speak with you again. As with the leaves changing colors and falling from the trees, as seasons do change, so do the times. With many global issues upon mankind at this time, the enviornment, world hunger, and the economy, now is the time for every human being, young and old, to gather all of your courage, strength and love to be the true essence of divinity that you really are. It is time for your God selves to come forth and be actively creating more harmony and unity with all of mankind. Each and every one of you makes a difference. Your thoughts, actions and deeds all matter. What is needed to heal humanity, those who are living ill thoughts of separation, deception and selfishness, is simply consideration. Treating others as you would want to be treated. In this is love of self and knowing and expressing your true essence of divinity with God. You are being asked to realize that YOU matter. Every single soul matters as to how humankind evolves on this planet right now. It is with love and admiration that we say this to you. It is with gratitude that we come to you. Wake up, remember that you truly are divinity and always are one with God/Creator. Be an example to others in all that you do and say. Take the time to connect with God/Creator and ask for and be open to receive the inner strength that you need. This is your time. You have the strength and the ability to prevail. With blessings to each of you and thanks for our time together. This day is your day; everyday is unique and full of unlimited possibilities. No day is ever the same as the last. What you do with your day, your time and your talents is yours alone to decide. Each day is a gift; each gift comes with its own responsibilities. Do you appreciate your gift of life? Are you using your talents? Do you share your talents with others? Today many are in need of not only material goods, but of personal support. Kindness, consideration, acknowledgement of being. Today, as in everyday, each moment consists of the thoughts that we have and the choices and actions that we make for ourselves and our lives. You have been given the gift of life, breath, thought, speech, sight, movement and free will. How are you using your gifts? You are able to lead others through your examples of caring or in giving, in even the smallest of ways. We remind you that you are one with Creator. Nothing is impossible. We ask you to love yourself enough to have self respect for oneself and others. These are the greatest gifts and lessons there are. Blessed with these truths your heart will open to the knowing that sharing your talents and gifts with others is a necessity. This has always been, today the need is more evident and intense. No actions go unnoticed, no deeds unrewarded, especially in regard to ones soul growth. What you do today creates tomorrow. Live in love, peace, and charity and your soul will grow in wisdom and grace.In helping one you help all. For more Angelic Messages click below. Thank you for once again allowing us to speak with you. With humanity fully understanding that old philosophies and beliefs that taught racism, elitism and greed must no longer be tolerated, and that drastic changes must be made globally for the betterment of all, as evident in the problems with the worlds global economy, nations political systems needing overhauling, global solutions needed for human rights and solutions needed for greater demands of food and water, mankind is now at a pivotol point in deciding its fate here on earth. These problems were not created overnight. It has taken thousands of years of living life as linear thinking human beings, believing and living a "me vs. you" mentality. Throughout the ages there has always been spiritual humans who taught and lived a spiritual life of love, faith in your connection with Creator and forgiveness. Humanity has been blessed with Jesus, Buddha, Shiva, Mohammed and other great spiritual leaders to guide you in living a life as a spiritual being. Their teachings were of knowing that there is a greater force that creates all of life, of humility, honesty, and respect for life and for each other. Through lifetimes it has continually been your personal choices that have brought you each here today. Now is the time to release yourself from old paradigms.We Angels are here to assist you in recalling your connection to God Creator; this is called faith. With your faith in your whole being and the knowing--trusting in the wisdom of your own soul, it is time to step out of your old hurts, anger, judgments, and self-pity and release yourself into unity with God Creator. With complete love and understanding from Creator and your soul, you may accept healing now and open your awareness to your spiritual oneness with the Divine. Now is the time for ACTION. There is no time for denial or illusions. You are worthy of living a blessed and harmonious life. As you trust in your faith you will again remember that you are and always have been one with The Source of all life. Human life is an illusion of seperation from God; it is your souls work to live as a spiritual being while maintaining a physical existence. Trust in your process; have faith in yourself. Know that you are worthy of a happy and fulfilling life. Call upon us to assist you with strength of heart, for that is where your true knowing comes from, and inner wisdom. It is your faith and trust that will carry you through this; and your inner knowing that this is true. With love and admiration for each of you.